The kidneys and lungs maintain the proper balance (proper pH level) of chemicals called acids and bases in the body. Decreased carbon dioxide (an acid) level or increased bicarbonate (a base) level makes the body too alkaline, a condition called alkalosis. There are different types of alkalosis. These are described below. Respiratory alkalosis is a condition marked by a low level of carbon dioxide in the blood due to breathing excessively. Metabolic alkalosis is caused by too much bicarbonate in the blood. 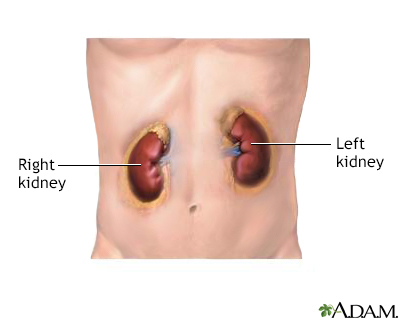 It can also occur due to certain kidney diseases. Hypochloremic alkalosis is caused by an extreme lack or loss of chloride, such as from prolonged vomiting. Hypokalemic alkalosis is caused by the kidneys' response to an extreme lack or loss of potassium. This can occur from taking certain water pills (diuretics). Compensated alkalosis occurs when the body returns the acid-base balance to normal in cases of alkalosis, but bicarbonate and carbon dioxide levels remain abnormal. Electrolytes test, such as basic metabolic panel to confirm alkalosis and show whether it is respiratory or metabolic alkalosis. To treat alkalosis, your provider needs to first find the underlying cause. For alkalosis caused by hyperventilation, breathing into a paper bag allows you to keep more carbon dioxide in your body, which improves the alkalosis. If your oxygen level is low, you may receive oxygen. Medicines may be needed to correct chemical loss (such as chloride and potassium). Your provider will monitor your vital signs (temperature, pulse, rate of breathing, and blood pressure). Most cases of alkalosis respond well to treatment. Call your provider if you become confused, unable to concentrate, or unable to "catch your breath." Prevention depends on the cause of the alkalosis. People with healthy kidneys and lungs do not usually have serious alkalosis. Little M. Metabolic emergencies. In: Cameron P, Jelinek G, Kelly A-M, Brown A, Little M, eds. Textbook of Adult Emergency Medicine. 4th ed. Philadelphia, PA: Elsevier Churchill Livingstone; 2015:chap 12.